If you follow along with me on Instagram Stories, you may have seen bits and pieces of this DIY painted dresser project before. 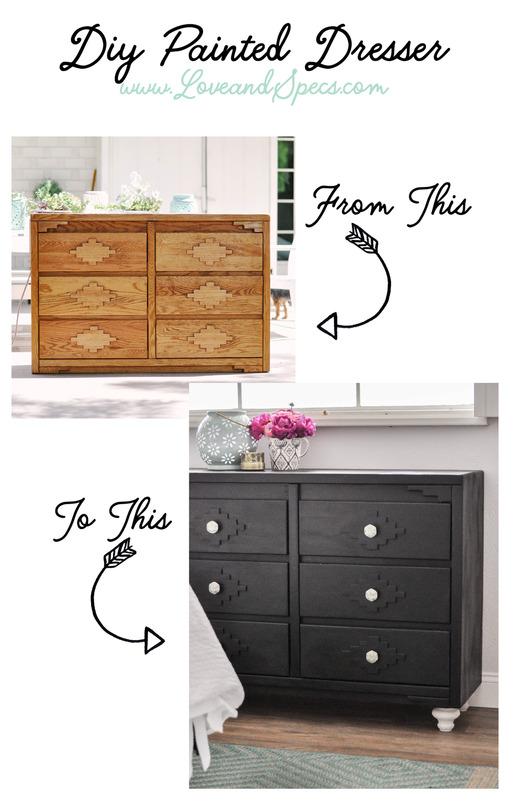 This DIY dresser makeover has been a long time in the making and as is always the case with our DIY projects, it was full of fun Craigslist adventures, indecision, trial and error... emphasis on the error... and many trips to Ace Hardware and Home Depot. In the end, this DIY painted dresser was one of the easiest DIYs we've ever tackled, but that's if you don't take a wrong turn and have to completely start over... like we did. Listen, I'd love to sit here and tell you that all of my DIY projects turn out beautifully on the first try and end up looking exactly as I'd hoped and imagined, but that's just not the reality of what happens in our DIY life and here on Love + Specs. I mess these projects up all the time, Chris rolls his eyes and wonders why he married such a paint-covered mess, my dad tells me that "that was a terrible solution to that problem" and "stop leading your readers down a bad path", I cry myself to sleep with my face stuck to my laptop keyboard in a pool of drool after going blind scrolling Pinterest... and then I do it all over again because I love it. And you don't get to see a lot of that here on the blog (although that's just another reason to follow along on Instagram Stories... it gets pretty ridiculous on there), but I can at least tell you the stories here. Oh, the stories. First things first, the Craigslist adventure. I'd been looking for the perfect dresser to make over for our master bedroom for so many months, with tons of "almosts" and no winners to be found. 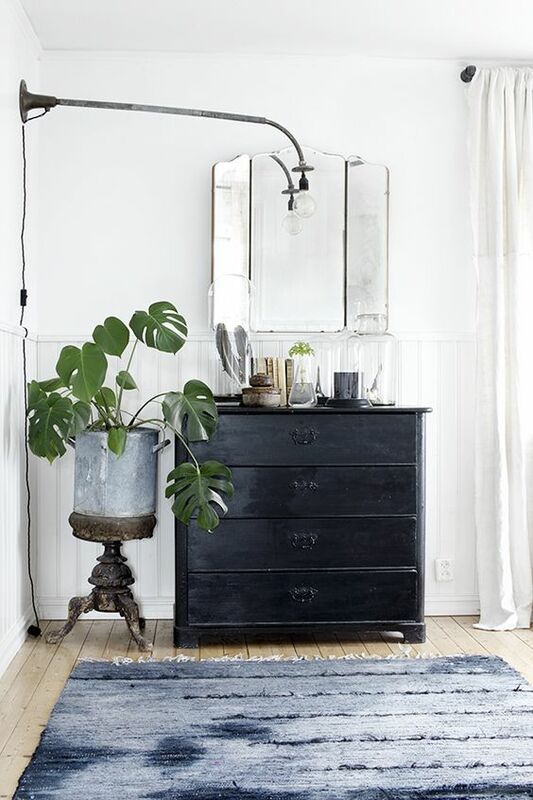 And if you're at all familiar with Craigslist, you know that looking for something like a perfectly worn piece of furniture that's super cheap, is the right style and dimensions for your space and isn't a total piece of junk is like finding a needle in a haystack. But finally one Saturday I stumbled upon this $50 gem and I knew it was "the one" for our DIY painted dresser project. Luckily, my mom and dad were in town at that time so I roped my dad into coming with me to pick this dresser up, and to say that it was an "interesting" experience is an understatement. I think the last thing my dad said to me before we got out of the car at the pickup location was, "should I bring my gun?" Enough said. And again if you're familiar with Craigslist, you know that sometimes you have to brave some pretty questionable conditions if you want to score a sweet piece of used furniture. Thank God for Papa Miller! After we picked up the dresser and brought it to the house, it was time to get my DIY plan in place. Over the years and after taking on tons of DIY projects, the one thing that I've realized is absolutely vital to a successful project is getting a really strong, clear, step by step plan in place that I'm 100% enthusiastic and confident about before I do anything. If I'm not extremely excited about how this project will look in the end and how I'm going to get there, it's never a good sign. But sometimes even I don't follow my own advice. 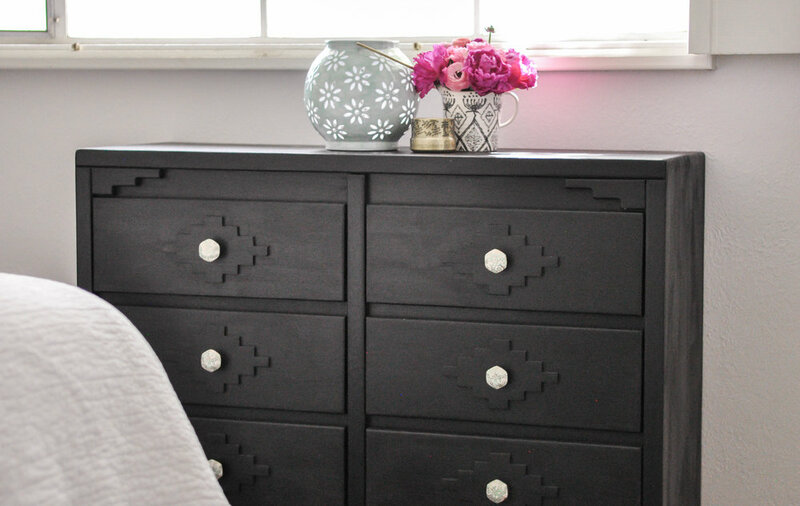 After sifting through a ton of Pinterest inspiration and standing in the middle of our master bedroom scratching my head many a night, I landed on painting the dresser in a charcoal grey chalk paint and then applying an all over topcoat with liming wax for a worn look. I'd never used liming wax before on one of my projects, but have long loved the antiqued finish it adds when I've seen it in photos. So I was excited to try it out, but wasn't 100% convinced that it was right for this particular project. Unfortunately, my curiosity took over and I decided I had to do it. So after sanding the entire dresser, painting it with my charcoal chalk paint and then applying the liming wax after watching about 100 YouTube videos about how best to apply it, I was... underwhelmed. 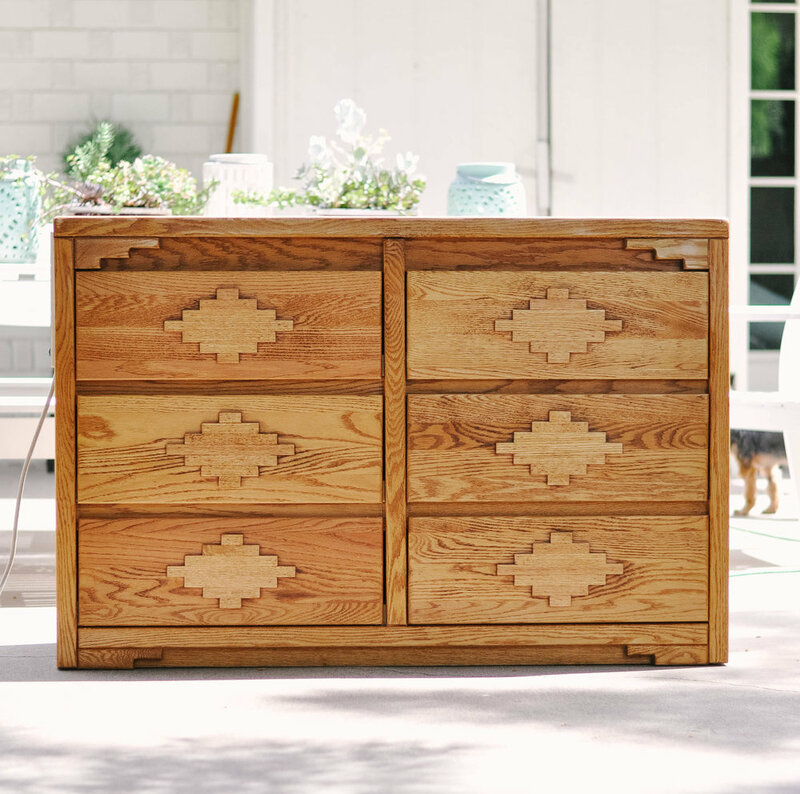 I also made the decision to leave the geometric appliques on the front of the drawers in their natural sanded state, sans paint, and then just apply the liming wax over the raw wood. It just wasn't good. Not good at all. The color was wrong. The chalk finish of the paint was wrong. The liming wax was really cool, but didn't look awesome on this dresser. And leaving the geometric appliques bare with only the liming wax over them made the whole thing look a little too far in the "desert not-so-chic" direction. We like having little touches of Southwest in our bedroom (see our Southwest-inspired DIY upholstered headboard HERE) and like mixing them in with our Scandinavian-farmhouse vibe, but this just made the whole room look like some weird 90s cowboy museum. So this is where things got rocky. What to do now? Well, the only thing to do was to strip that sucker... completely... re-sand the entire thing and figure out a new plan. And sure that sounds fine in theory, but if you've ever stripped paint off of a piece of furniture before, you know that it's insanely messy. And stinky. And gross. And just not awesome. But this time I roped Chris into helping me and we both went in hard with the scraper, tackled it in one night and in the end every inch of that charcoal paint and wax came off and we were ready to begin again. Lessons learned, people. Lessons. Learned. Who needs a drink? So after much contemplation and more Pinspiration searches, I decided that this thing needed to be painted (not sprayed) black and in a satin finish, and although those geometric appliques are super cool and made the dresser the funky, fun find it was, I needed to tone the Southwest-ness of the dresser down slightly by also painting those the same color. I'd toyed with the idea of whitewashing the entire thing, but there is so much white going on in our bedroom that I felt like it needed a contrasting piece and it needed to be black to tie in with the rest of the black and white items in the room. But then I realized that I could make the entire thing a little bit more boho and substantial by adding 4-inch feet to it and whitewashing those. My dad ended up affixing the feet to the dresser for me because the bottom was recessed and if we had just affixed the feet as is, I wouldn't have gotten my full four inches and you wouldn't have even been able to see them, and I really wanted that height and that whitewashed pop on bottom. And because my dad just hates when I give you guys bad advice by doing some easy, quick fix that's a little less than elegant (or smart), I just let him figure this one out this time. Which he did and it's wonderful! He would like me to note for all those interested that the way he affixed these feet to the dresser is the correct way and the most secure and stable way to affix these feet. There was a little bit of genius engineering and math involved, which he'd also like me to note, but he says that essentially, "we had to shim the legs up and create a new mounting method for the legs so we bolted it through by countersinking the head of the bolt. Lag bolts went through the bottom of the dresser (again, they were countersunk), then through the shims, then into the feet. Boom. Done." If you encounter this problem while wanting to add feet to any large furniture piece, I have a much more detailed explanation of his method with measurements, tools and all, so feel free to leave a comment in the comments section below if you want details! I also wanted to tie the dresser to our lovely nightstands (see that post HERE) by adding some fun Anthropologie knobs that are similar to the ones we used on the nightstands. Synergy, people. Synergy. And the rest is history and what you see in the photos, and it was all done on a relatively small budget (not counting the major mistakes and materials involved there), though I made up for that in the emotional price paid. So $50 for the dresser, then $40 for the feet, $17 for the paint, $60 for the knobs (and you could totally get awesome and way less expensive knobs if you wanted to) and I already had the white chalk paint. So around $170 for a beautiful new dresser, which I count as a win in today's market! I really do enjoy the final product of this DIY dresser project and it obviously wasn't difficult to accomplish. If I had done this from the start, all that would have been required is some sanding, painting, attach the legs, attach the knobs and voila, you're done! But see below for links to the materials used and the step by step with a few tips for a perfect DIY painted dresser. 1. Sand your piece with a power sander or medium grit, all-purpose sanding block. I used a power sander because this was a) a large piece of furniture and b) seemed to be sealed with some sort of light lacquer. 2. 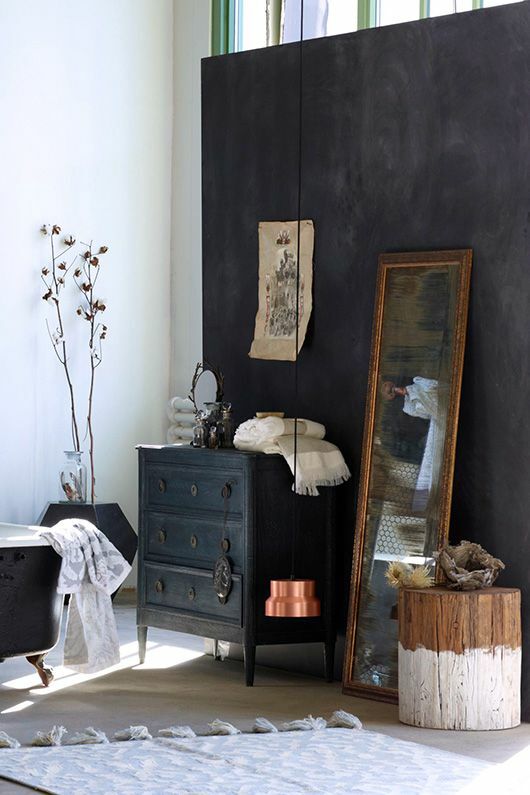 For my black paint I used a basic, exterior black paint to paint, applied with a brush painting with the grain throughout the dresser. I used regular paint instead of spray paint and applied it with a brush because I didn't want it to have that perfectly sprayed finish and I used an exterior paint because it would be durable enough to hold up to wear and water on the top of the dresser, but wouldn't have to be sealed. And you can totally seal something like with a number of things this and it's worth it if you want it to be bulletproof, but I want it to wear naturally and imperfectly (boho, people. boho.) and this should do the trick. It's also easy to clean - I've tried and tested it and it cleans perfectly. TIP: On the fronts of the dresser drawers I used a smaller brush to achieve even strokes that could also easily get into the crevices around the appliques without those brush strokes showing up. 3. For the whitewash, I mixed equal parts Rustoleum Chalked chalk paint in Linen White and warm water. Mix the paint with a paint stick until the white paint appears dissolved into the water, and you're ready to apply to your feet. You can apply the whitewash with a specific chalk brush, or just any large soft-bristled brush you want. It's meant to be perfectly imperfect, so drips aside, embrace the somewhat uneven coverage of your whitewash. 4. Apply your whitewash in even strokes running in the same direction as the grain of the wood. 5. After the first coat dried, I applied a second coat of black paint to my dresser and drawer fronts because it needed it for coverage purposes. 6. 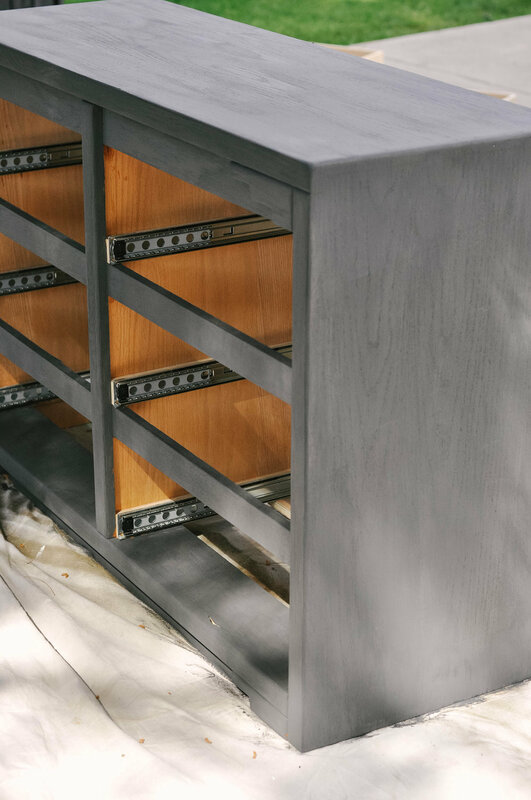 To attach the knobs to the drawer fronts, we simply measured to the center of the appliques and drilled through the front of the drawers. Luckily this time the length of the bolt on the knob was just about perfect for the thickness of the drawer front plus the applique, so we didn't have to cut them to size. Score! 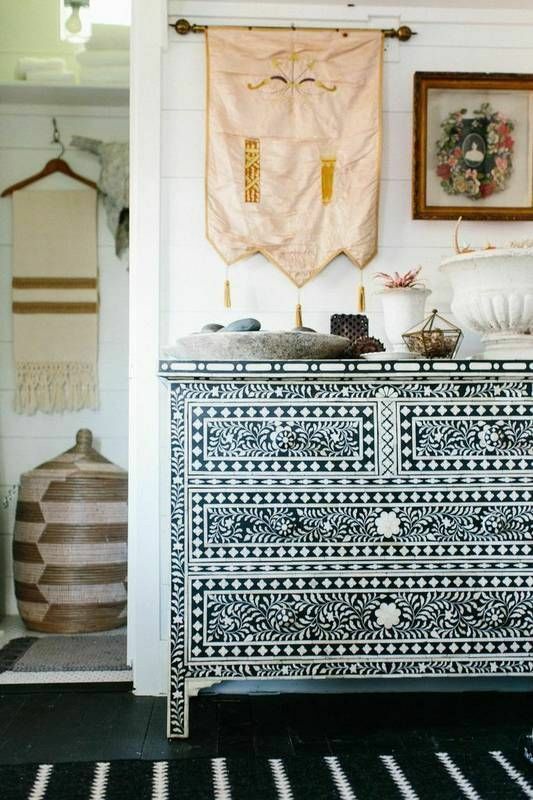 On another note, I've kind of become intrigued by the idea of doing a faux bone inlay on a dresser... and am wondering if it might be fun to try some stencil work to achieve that on this dresser! All it would require is the right stencil (I've seen a few cool ones out here), some white paint and bam! But what do you guys think? To faux bone inlay or not to faux bone inlay... that is the question. Leave me a comment and let me know your vote!